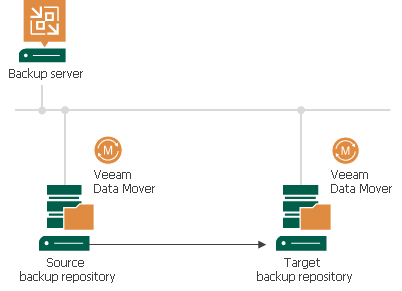 Veeam Backup & Replication transports data directly from the source backup repository to the target backup repository. This type of data transport is recommended for copying backups to onsite backup repositories or offsite backup repositories over fast connections. Microsoft Windows and Linux repositories. Veeam Backup & Replication uses the source Veeam Data Mover on the source backup repository and target Veeam Data Mover on the target backup repository. Shared folder backup repository. 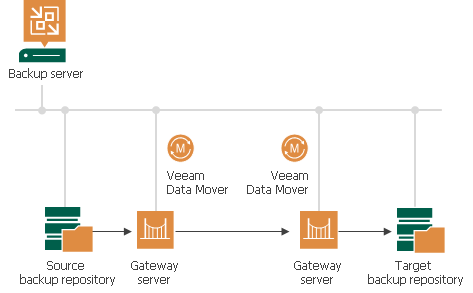 If you have instructed Veeam Backup & Replication to automatically select the gateway server, Veeam Backup & Replication will use Veeam Data Movers deployed on mount servers associated with backup repositories. In case mount servers cannot be used for some reason, Veeam Backup & Replication will fail over to the backup server. If you have explicitly defined the gateway server, Veeam Backup & Replication will use the source Veeam Data Mover on the gateway server in the source site and target Veeam Data Mover on the gateway server on the target site. 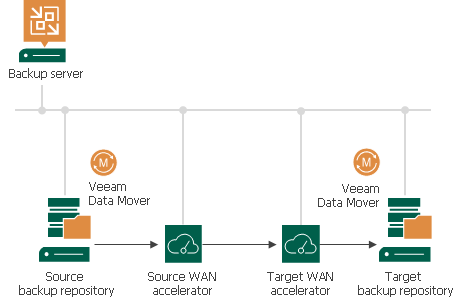 Veeam Backup & Replication transports data through a pair of WAN accelerators: one deployed on the source side and the other one deployed on the target side. WAN accelerators remove redundant blocks before transferring data and thus significantly reduce the amount of traffic going over the network. This type of data transport is recommended for copying backups offsite over slow connections or WAN. The WAN acceleration technology is available in the Enterprise Plus Edition of Veeam Backup & Replication. For more information, see WAN Acceleration. Shared folder backup repository. If you have instructed Veeam Backup & Replication to automatically select the gateway server, Veeam Backup & Replication will use the Data Mover Services deployed on the source and/or target WAN accelerator. If you have explicitly defined the gateway server, Veeam Backup & Replication will use the source Veeam Data Mover on the gateway server in the source site and target Veeam Data Mover on the gateway server on the target site.